Impressive "tail fin" landing by the reusable rocket New Shephard. Nice going, Blue Origin! The company’s craft, New Shepard, launched to the edge of space before successfully landing back on its landing site in West Texas. Blue Origin founder Jeff Bezos called the it “the rarest of beasts—a used rocket.” New Shepard reportedly flew a “flawless mission,” reaching an altitude of 100,534 meters (329,839 feet) and then executing a gentle, controlled landing only a few feet off of the center of pad. The craft is a vertical takeoff and vertical landing space vehicle named after the first American in space, Alan Shepard. It is comprised of a crew capsule and a rocket booster that is capable of carrying six astronauts past 100 kilometers (62 miles). The crew capsule separates from the booster, which then descends to the landing pad using guided flight and – best of all – it can be reused. The rocket booster is powered by a single BE-3 liquid hydrogen, liquid oxygen engine, delivering 110,00 pounds of thrust. Prior to landing, the booster is able to re-ignite the engine to decelerate down to 7 km/h (4.4 mph), allowing for a gentle vertical landing. “Full reuse is a game changer, and we can’t wait to fuel up and fly again,” says Bezos. 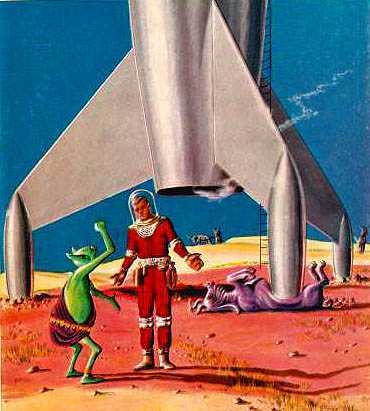 All true fen (i.e., old fans) believe that one day all spacecraft will be able to take off and land on their tails, just as God and Robert Heinlein intended. Amen.